The global upsurge in the streets and through new social movements presents a conundrum for human rights groups; on the one hand, it creates a tsunami of unpredictable change, while on the other hand, it promises new opportunities for renewal. Human rights groups around the world must innovate or risk being rendered irrelevant by the new surge of street activism. The African region is no exception, despite its diversity. Consider Senegal, where in 2011 the Y’en a Marre (“Enough-is-Enough”) youth movement and Mouvement 23 (“June 23 Movement”) seized the limelight during a turbulent political moment, and played a critical role in preventing former President Abdoulaye Wade’s attempt to amend the constitutional provision on term limits and hang on to power. In the process, long-established and extremely important Senegalese human rights organizations, such as Rencontre Africaine pour la Défense des Droits de l'Homme (RADDHO), appeared virtually irrelevant. They were not always present on the streets, and were not consistently able to use the moment to give their causes new visibility. How can professional human rights organizations become more nimble, while also maximizing impact and sustaining their work over the long term? Doing all these things is crucial to remaining relevant in an age of increased grass roots activism. In Africa today, some say that social movements are more representative of the public’s desires than mainstream human rights groups. Are they? They do perhaps have a better sense than conventional civil society groups about what “people really care about”, and how intensely their grievances are felt. These movements also claim to be better at including more diverse demographics, including youth, into their campaigns and protests. And, perhaps, due to more flexible and agile structures, they can act more quickly. 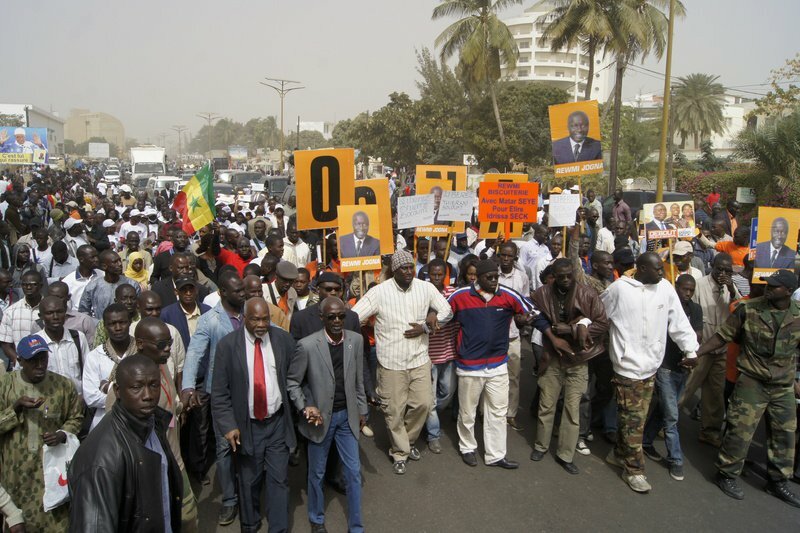 A Mouvement 23 protest in Dakar, Senegal. Professional African rights organizations by contrast tend to focus on reforming the state, or on interacting with international organizations. No doubt this continues to be tremendously important. However, as ordinary people have less trust in state institutions and international organizations, they may also trust human rights organizations less. African organizations are also dependent on Northern donors, forcing their activities and thinking into short-term, project-based frameworks. As a result, they can’t see what’s going on in the periphery of their areas of expertise, even if those new developments are game changers. Moreover, ordinary people are often moved to action by events that are not on the human rights organizations’ radar. Thus, the mass movement that also mobilized so rapidly and powerfully against long-time Burkina Faso president Blaise Compaoré took most local human rights organizations completely by surprise. Mass mobilization, of course, is to be welcomed, as human rights can only be durably protected when ordinary people stand up for their rights. These traditional elements can form a bridge between moments of social protest, while also providing access to stable financing. Fast-moving, street-smart “fluidity” is thus crucial. At the same time, Senegal and other African countries also need the “solidity” of the traditional rights groups, including their permanent organizational structures, and their expert, paid staff. These traditional elements can form a bridge between moments of social protest, while also providing access to stable financing. This, in turn, will help sustain human rights campaigns over time. To maintain their relevance, however, African rights groups will have to become more innovative and nimble. They must keep their ears to the ground, forging new and more creative partnerships with participants of new social movements. Both the “fluid” new actors and the “solid” conventional organizations must take a good look in the mirror, and figure out how best to create these alliances. The conventional organizations can’t lose by extending an olive branch to new social groups with significant followings; this will help them join fast-moving civil society demands without necessarily losing their own sense of mission and profile. They will also gain an opportunity to build constituencies in new social sectors. Protagonists of new social groups, for their part, can take the lead during moments of public protest, drawing additional legitimacy from their partnership with the established human rights groups. As previous openGlobalRights authors have written, human rights groups must also figure out how to diversify their funding sources, and raise more domestic money. Today, most African rights groups depend on foreign donors, but this does not have to remain forever true. As Austrian theologian Friedrich von Hügel said, “The Golden Rule is to help those you love to escape from you.” If foreign donors really do want to help African rights organizations, they must assist in creating a domestic philanthropic infrastructure. During and after Africa’s liberation struggles in the 1960s, many groups became political parties, and lost touch with their organic roots. Let’s not allow the same thing to happen to African human rights groups.